Gwyneth Paltrow has recently released a new cook book "My Father's Daughter" . She was recently showcased in Bon Appetit Magazine and this recipe is one of my favorites! 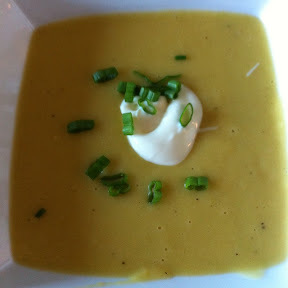 Vichyssoise (pronounced /ˌvɪʃiːˈswɑːz/ US dict: vi·shē·swäz′) is a thick soup made of puréed leeks, onions, potatoes, cream, and chicken stock. It is traditionally served cold, but can also be eaten hot. Heat the oil in a large heavy pot over medium heat. Add leeks and cook, stirring occasionally until softened. 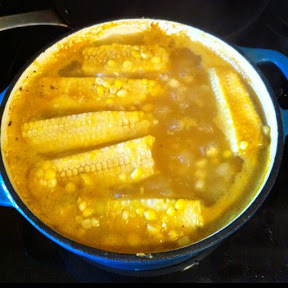 Add corn kernels, and reserved cobs (I broke them in half because my pan was not that big), potato and veggie stock. Season lightly with salt and pepper. Increase heat to high and bring soup to a boil. Reduce heat and simmer, cover with lid slight ajar, and cook till veggies are soft, about 35 min. Discard the cobs and let soup cool slightly. Working in batches, puree soup in a blender until very smooth. I loved this soup hot you can chill the soup as well. If it gets too thick, thin with water by the 1/4 cupfuls. Season with salt and pepper. Spoon a dollop of creme fraiche atop each serving and sprinkle with chives.